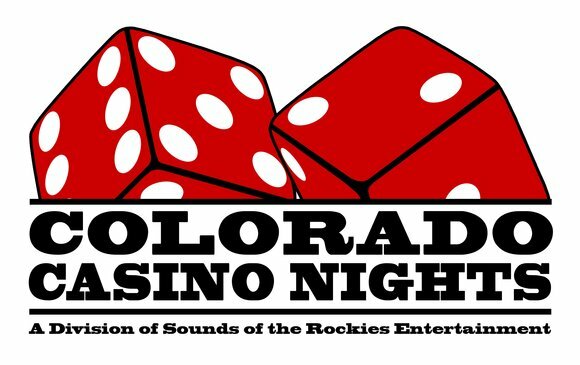 Colorado Casino Nights offers Let It Ride - a casino variation of poker, Let It Ride is played against the casino rather than against the other players. The game's pace and the chance to pull back two of the three bets has made Let It Ride popular with older players and table game neophytes. Let It Ride is a variation of five-card stud where the player wagers on a poker hand consisting of three cards in the player's hand and two community cards in the dealer's hand. Like in video poker, the payout is determined by the ranking of the player's hand and the payout schedule. 7-player casino size Let It Ride table with original casino lay out. 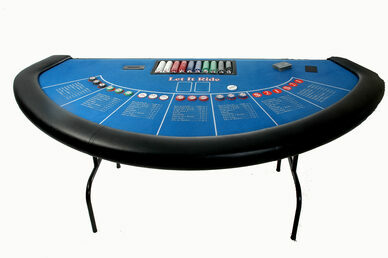 This table is built using the same design and quality that is found on professional casino Let It Ride tables. Requires One Dealer. Let It Ride is a variation of five-card stud where the player wagers on a poker hand consisting of three cards in the player's hand and two community cards in the dealer's hand. Like in video poker, the payout is determined by the ranking of the player's hand and the payout schedule. Please note that this is the standard payout schedule used at most casinos. Other payout schedules exist at the option of individual casinos, and appropriate strategy changes with different payout schedules. Each player places three equal bets in three spaces labeled (1),(2) and ($). Some casinos offer an optional $1 side bet. This side bet offers an additional payout if the player's first three cards contains a winning hand. The house edge on this bet is generally over 13%, making it one of the worst bets for a player in a casino. A more common $1 side bet is against a fixed payout scheduling typically starting with two pair (typically a $4 payout, but really only 3:1 since the original dollar is collected before the hand is dealt) or three of a kind (typically a $8 payout). Each player receives three face down cards. The dealer receives two cards face down. Let It Ride compares the player's poker hand with a payout chart, rather than comparing it with the other players' hands or the dealer's hand. The player's hand consists of the player's three cards and the dealer's two cards. Each player is required to keep the three cards in full view of the dealer at all times. Winners are paid according to the payout schedule (pair of 10's or better, two pair, etc.). After looking at his three cards, each player has the option of pulling back the first bet or leaving the wager there. To leave the bet live is to "let it ride". The dealer then exposes one community card. The players then each have the option of pulling back the second bet or letting it ride. After each player decides whether or not to pull back the second bet, the cards are placed face down on the designated area of the layout and may not be touched again. The dealer then turns up the second community card and in a counterclockwise direction, turns the three cards of each player face up. All losing wagers are then collected, and then all winning hands are paid by the dealer according to the payout schedule. Players are not allowed to show their hands to the other players, as this gives them an advantage by increasing their chances of knowing what cards the dealer is likely to turn up. In many casinos this is often not enforced at all or very sparingly. At a full table, it is sometimes difficult not to see the cards of a player on either side of you. Like blackjack and video poker, player decisions in this game affect the house edge. The strategy outlined below assumes the standard payout structure shown above. With correct strategy, the casino's edge in Let It Ride is about 3.5%. Any three cards to a royal flush. Any three suited connectors where the lowest card is three or above. Any four to an outside straight. Any four to an inside straight, if the four cards are ten or higher. An outside straight is a draw to a straight that can be completed by two different cards, like 4-5-6-7. Any 3 and any 8 will complete the straight. There are eight cards in the deck that will complete an outside straight draw. An inside straight is a draw to a straight that can only be completed by one specific card, like 4-5-6-8. Any 7 will complete the straight. There are only four cards in the deck that will complete an inside straight draw.